Mobile accessories are a way to enhance the smartphone experience as well as adding extra layer of protection for the device. With the advancement in mobile phones, accessories have also seen major innovation in terms of both design and utility. Tempered screen guard, scratch resistant guards, bumper case, flip covers, graphic design covers and so on. 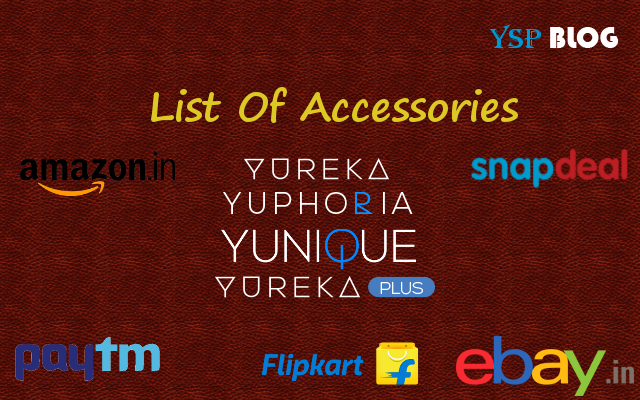 We have made this post with purpose of providing all the accessories for Yureka, Yuphoria, Yunique, Yureka Plus in one place so that you don't have to look place to place. We have added links from top 5 e-commerce websites in India i.e. Flipkart, Amazon, Snapdeal, e-bay, PayTm. Cases & Covers Provide extra layer of protection against accidental as well as intentional drops, they also add a unique design to the phone. While choosing covers for your device look for both protection as well as design. We recommend Bumper Cases, Flip Covers and Hard Back Covers. A wide variety of screen guards are available now on the market like scratch guard, matte , tempered glass etc. Our main recommendations in this regard is go for Tempered Glass as they can protect your screen from most type of falls. These accessories have been made available officially by YU Team. These accessories have been made is from different brands and available on various websites, we are listing accessories from Amazon, e-bay, Flipkart, PayTm, Snapdeal. Note: The products are listed according to the popularity. We hope this list has been helpful in finding accessories for your YU device. if you're looking for buying memory cards for your device check out our memory card Buying Guide. Do give your feedback whether this list was helpful to you or not or any other suggestions you might have for us in the comments below or email us at info@yurekasupport.com. Please note that all the links have been tested by us, but in case you encounter a broken link don't forget to report it us. Happy accessorizing.